HMI Is Again Anticipating Putting On “A REALLY BIG – AND DEEP – SHOW” at The World Of Concrete in Las Vegas. There are exactly 62 days until the curtain goes up for “Greatest Show in Concrete.” Will I be seeing you in Las Vegas? 2019 will represent the 40 consecutive year HMI has been participating in the BIG SHOW! The greatest show deserves the greatest demonstrations. Again in 2019 HMI is planning new and exciting exhibits and presentations. 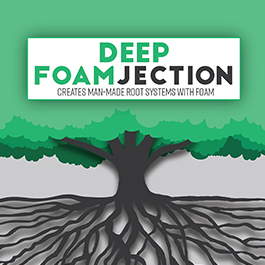 This year we will feature our DEEP INJECTIONS SYSTEM & PRODUCTS. You may think you are at the circus as we climb to heights to inject our patented hydrophobic foam deep through our patented injection pipes utilizing the ELITE ONE gun. Demonstrations will be continuous over three and half days from January 22nd through January 25th. We plan to break the record this year with over 100 flawless demos and lifts. HMI will again be in the SILVER LOT at booth 041045. Nearly the entire HMI team will be at the show. Plan on stopping by to visit: Jeff, Brian, Jen, Jason, Kip, Teddy, Jesse, Paul and ME! The team is excited. For us the World of Concrete is like a reunion as we see old friends from Discovery & Training Seminars over the past decade. Catching up with members of the HMI family on; business, life and home clans is what is often most important about attendance. HMI has coupon codes available for show registration discounts. Visit our WEB SITE or call us and save.